Every room has a safe & storage space under the bed. Mitre House is a mixed gender residence offering single occupancy of double rooms. All bedrooms have en-suite showering/toilet facilities. Wi-fi is available throughout the building. Rooms share communal kitchen/TV lounges. A buffet style breakfast (including full English Breakfast) is available in the mornings for £6. Breakfast is served Monday to Friday from 7.00am until 10.00am. Saturday, Sunday and Bank Holidays from 8.00am until 11.00am. A Laundry room with coin-operated washing machines and dryers is available on the ground floor with approximate costs of £2.80 for a wash and £1.50 for a dry. Mitre House is a 15 minute walk from the city centre or a 10 minute journey using public transport. Mitre House is a 15 minute walk from EC Brighton school or a 10-minute journey using public transport. 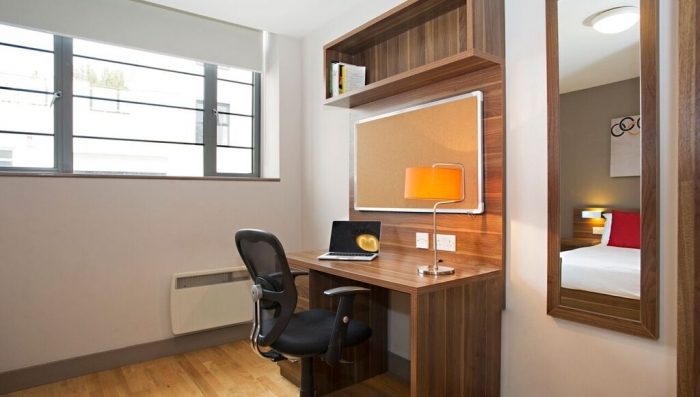 This residence accommodates both male and female students. If you are unable to check into your residence on the pre- booked day of arrival, please call the emergency number and advise our staff of your intended check in date and estimated time of arrival.